Time is passing by and you still haven’t found that perfect gift? Don’t worry; Icelink is here to help you with an original idea: the 6Timezone Alarm Clock. 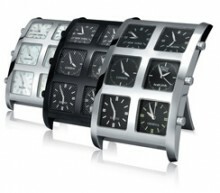 Successfully launched a few years ago, with its signature Icelink shape, the 6Timezone finds a new expression. The Alarm Clock with its six time zones and two alarms will find its place any glam-chic alcove. The hour-markers of the two alarm dials and all the hands are illuminated with Superluminova which glow in the dark for ease of reading at night. The guarantee is 2 years. The 6Timezone Alarm Clocks are available in steel with metallic black dials ($3,800), steel with MOP dials ($4,000) or black PVD with carbon dials ($4,200).